The word “bunker” evokes images of a grim concrete shelter; dark, dank and ugly. Well maybe for most people, but not if you’re the Red Tsar. 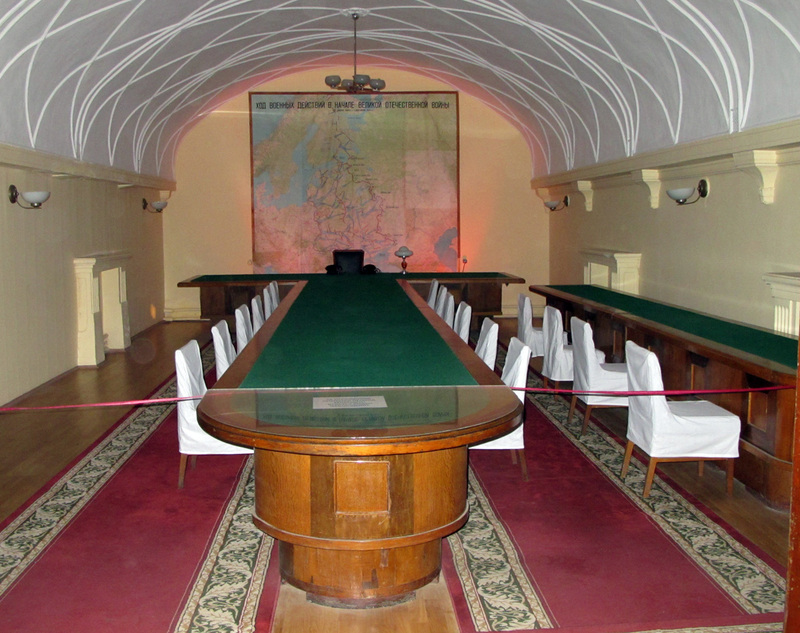 Moscow’s Stalin Bunker is positively palatial, with faux marble columns, a large domed conference room, and a paneled private office. 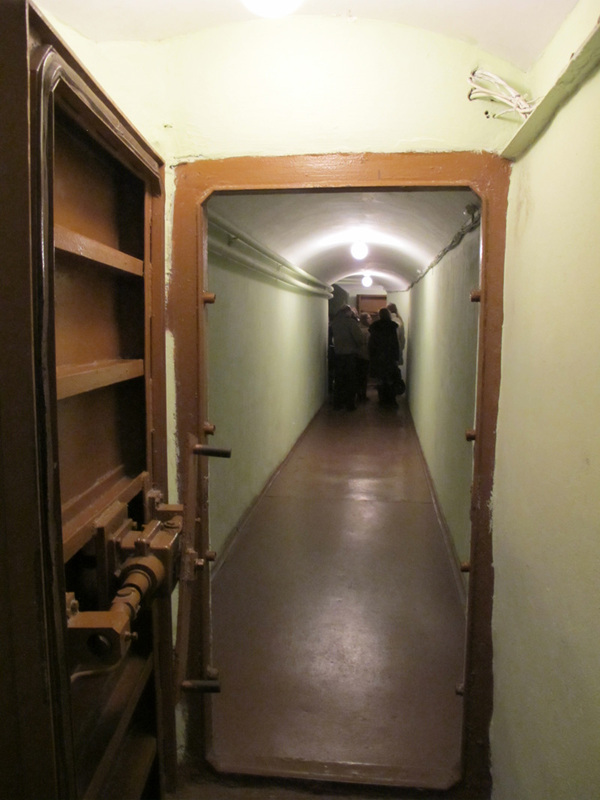 Between 1933 and 1939 the Soviets built a sprawling secret underground bunker complex at Izmailova, in the Eastern suburbs of Moscow, as a refuge from potential German air attacks. It was built using convict labor, under the pretense of being foundations for a giant stadium. “Stalin’s Bunker” was an even more secret refuge within this complex. 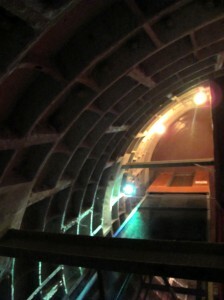 The bunkers are connected by a 15km tunnel to central Moscow, with various side connections into the metro network. The complex was abandoned in 1949, as it was far too shallow to resist nuclear weapons. It fell into disrepair and then after 1991, the Stalin Bunker section was restored and opened as a museum. 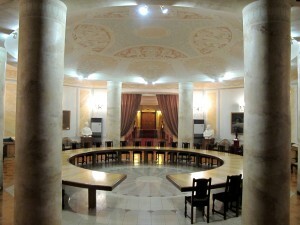 Unfortunately most of the furniture and decorations are not original, but my guide assured me that they’d tried hard to reconstruct the original appearance, and pointed out a few pieces of original furnishings. Although it was built for Stalin, he never actually used it as his main base. 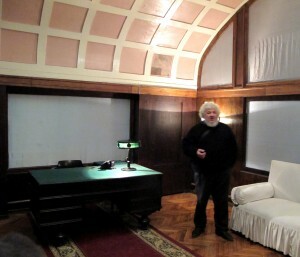 He probably visited on a couple of occasions, but he preferred to stay based nearer the Kremlin. Chair is original, Scotsman is not. The central conference room has impressive acoustics, supposedly so that the quiet spoken Stalin could be easily heard by all his subordinates. 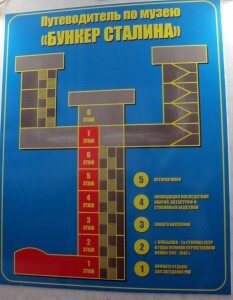 The Stalin Bunker is still well hidden, with no external signage. 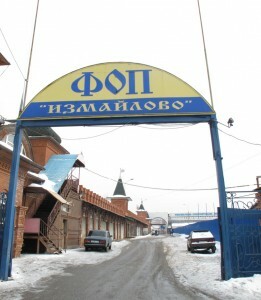 It’s at 55.797412, 37.751028 at Izmailova. Use the Partizanskaya Metro stop, then go North along 890th Proyektiruemyy Prospekt, past the fantasy-land Izmailova Kremlin and look for a side lane East marked “ФОП ИЗМАЙЛОВО”. At the end is a closed gate. 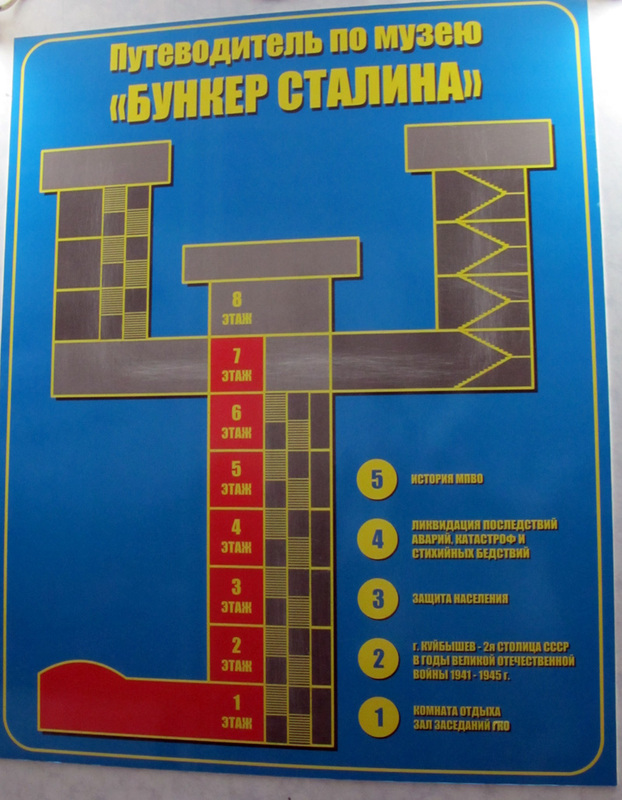 At the pedestrian entry at the side of the gate, explain that you’re going to “Bunker Stalina” and they will let you through. Then head down the ramp to the right. At this point you’ll see the guardian tanks. 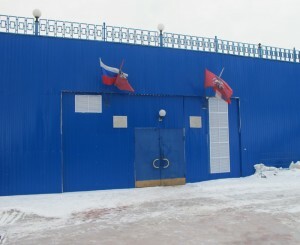 The bunker entrance is through the blue steel doors opposite the tanks. 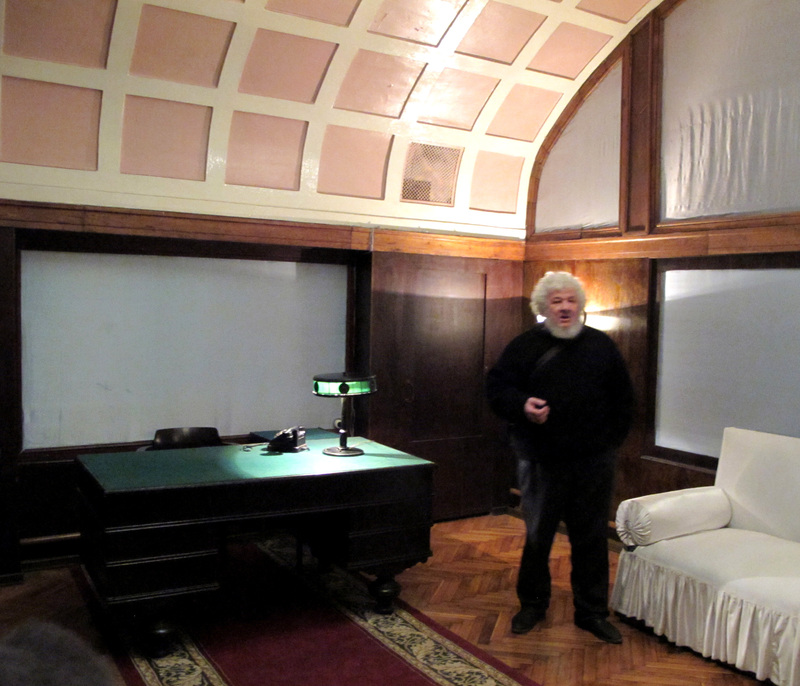 You need to book a tour in advance and it’s not cheap. The price depends on the group size, from 4900 Rubles for a one person tour, to 1600 Rubles each for a group of six and up. That will get you a knowledgeable English speaking guide and about an hour inside the bunker. Their website (in Russian) is at www.cmaf.ru/branchs/bun Their contact email is sbunker@mail.ru. 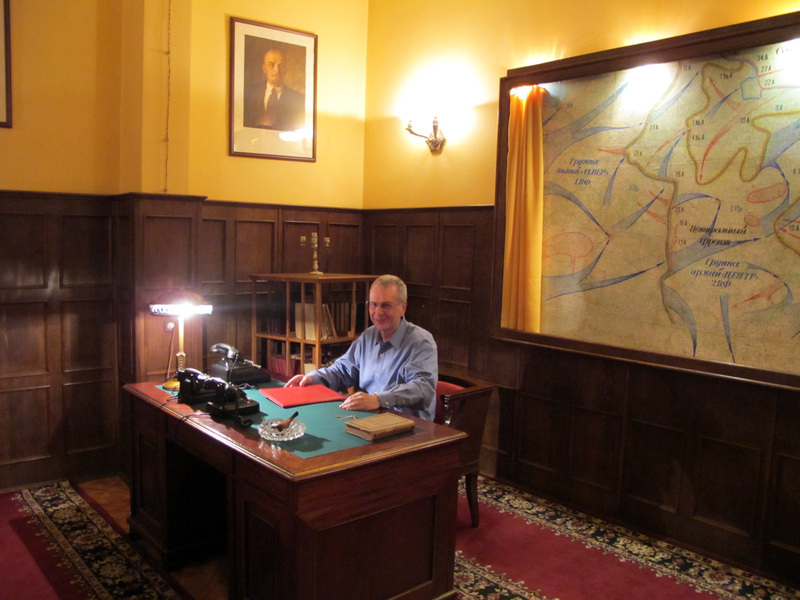 I’m in Vladikavkaz (“Lord of the Caucasus”), North Ossetia, Russian Federation, where Stalin lurks. I was visiting the fine WWII memorial park “Monument to Glory”. And there he was, posed casually in front of a giant historical mosaic. 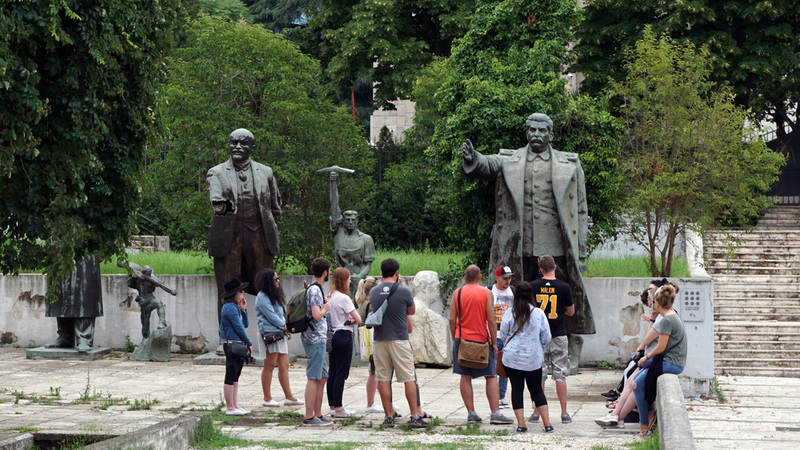 The most surprising part is that the bust is new, added in 2009 by the local Communist Party. Presumably with the assent of the city government. 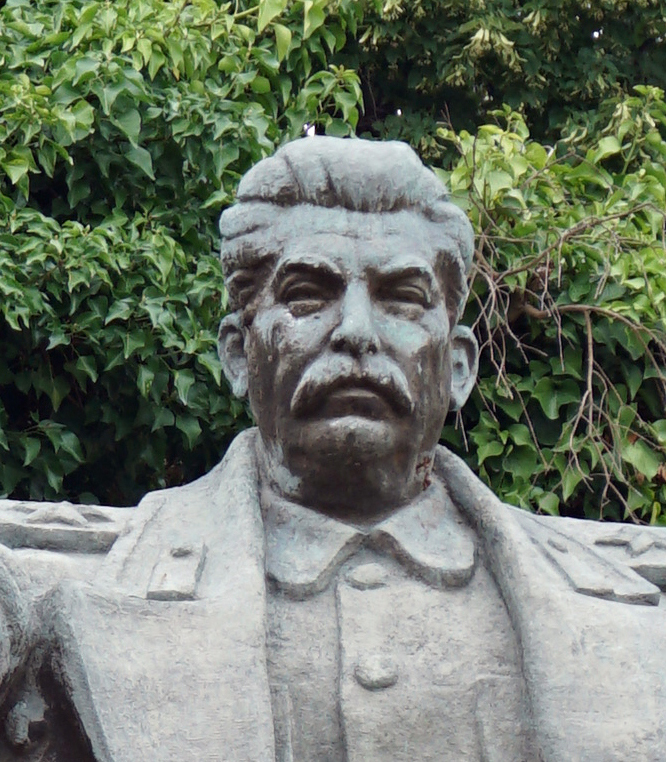 According to the Lonely Planet Russian guide, there are at least a couple of other Stalin busts lurking around North Ossetia. Lonely Planet asserts that there is a local fondness for Stalin due to ethnic politics: in the 1940s, Stalin left the Ossetians in place but deported their hated ethnic enemies, the Ingush, en masse. Hmm. It’s possible, but it seems a stretch. As it happens, the memorial park also has a small, touching memorial to the 2004 Beslan tragedy, when Ingush and Chechen terrorists attacked a North Ossetian school. 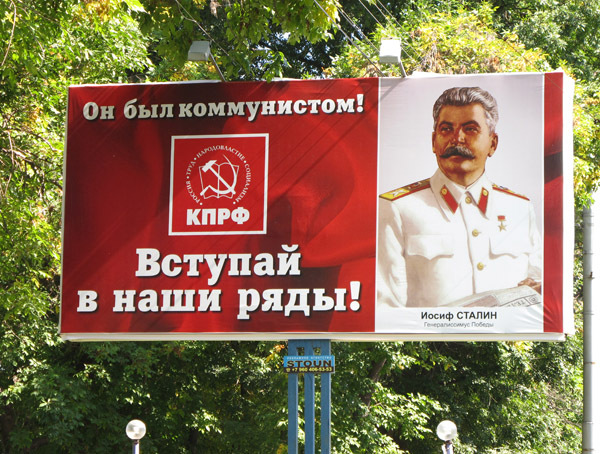 Also in Vladikavkaz I spotted an unexpected billboard. At first I thought it must be an advert for the Russian equivalent of the History Channel, or suchlike. But no, it’s quite serious. 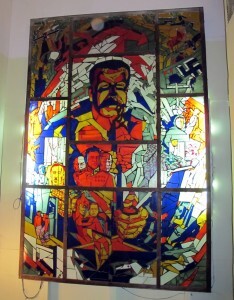 It’s from the Communist Party of the Russian Federation and the message is “He was a communist! Come join us!” Interesting! No hint of ambiguity or historical reticence there. 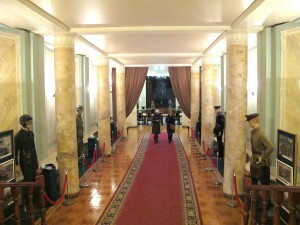 The Memorial include busts of the principal allied commanders and of all the principal allied leaders. 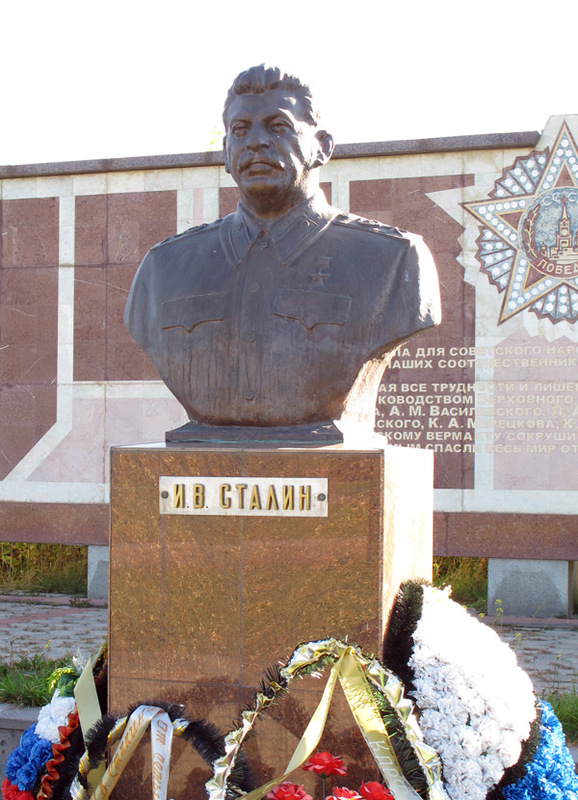 The Stalin bust is on the unfashionable, little visited Eastern edge of the Memorial. 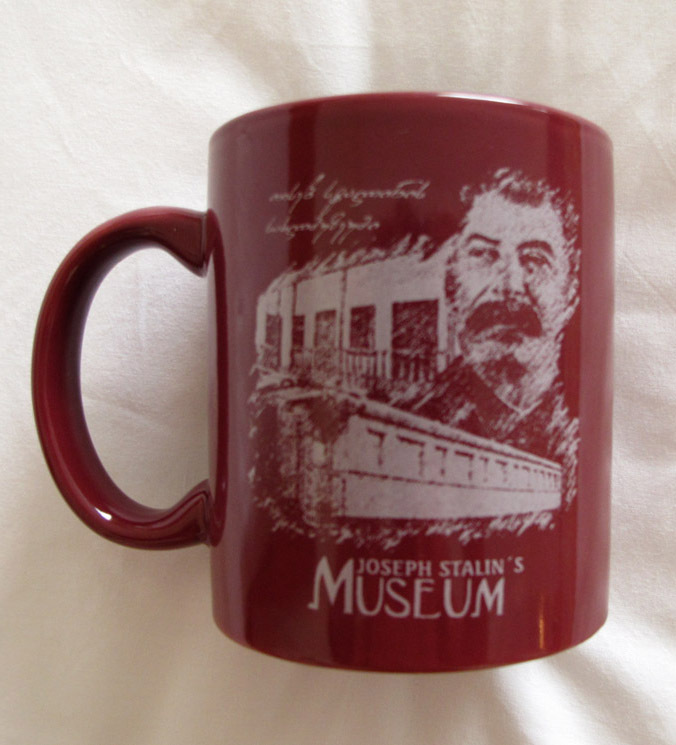 It is the only publicly displayed Stalin bust that I know of in the US. The biographical plaque takes prominent note of the elimination of the Kulaks, the Great Terror, and the relocation of nations. Unfortunately all the leader busts are quite weak. Stalin is a bland representation of a stern faced foreigner with a moustache. 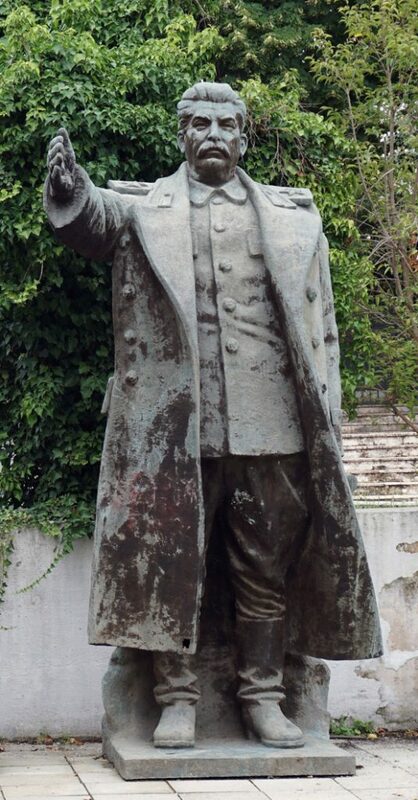 It lacks the personality one sees in the better Stalin busts or photographs. There is no hint of the sly, insightful look in the eye, or that subtly malicious, knowing smile. Oh well: the Churchill is even worse and the Truman is almost unrecognizable. Other parts of the Memorial are much better. There is a well conceived memorial pool with bronze soldiers wading to the beach from a landing craft. 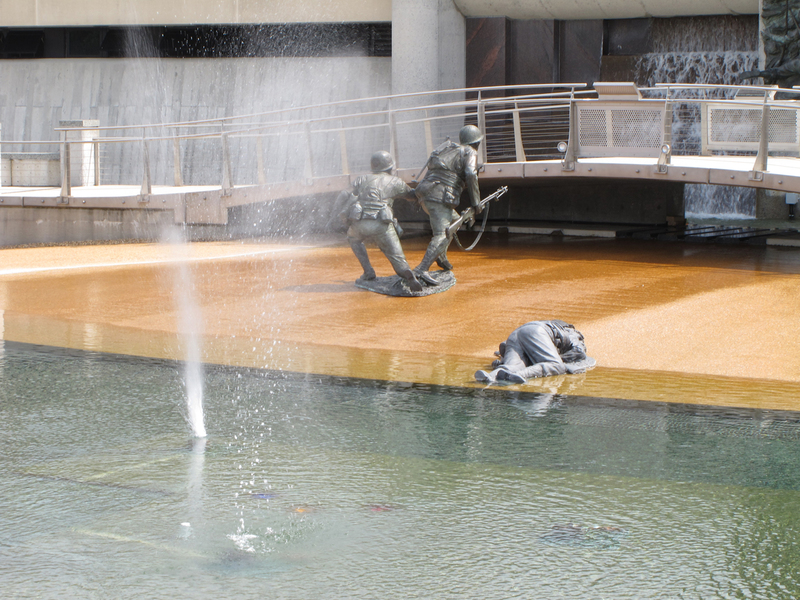 A series of hidden high pressure fountains erupt sporadically among the troops. Noisy and unpredictable, they simulate incoming rifle fire and add dynamism to the scene. Well worth a visit if you are in central Virginia. 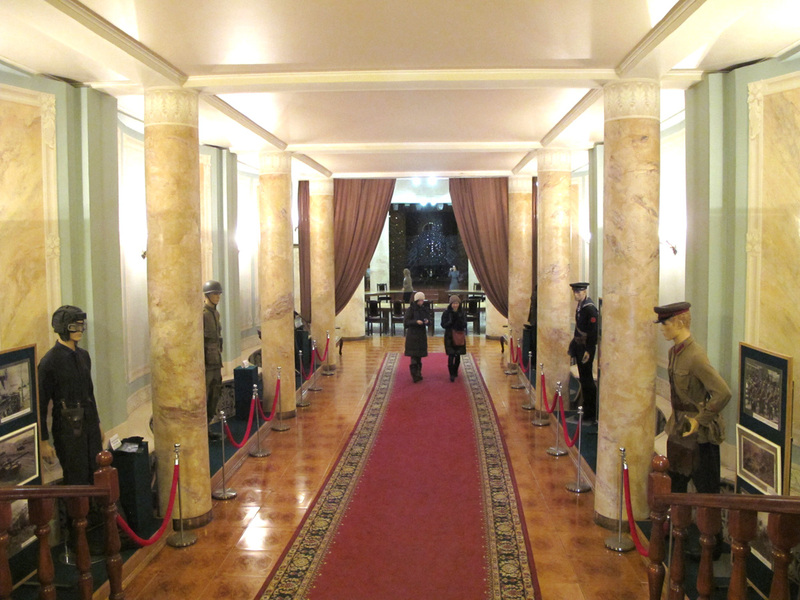 Despite the 2008 war, neither Gori nor its famous Stalin Museum seem to have changed much since my previous visit in 2007. 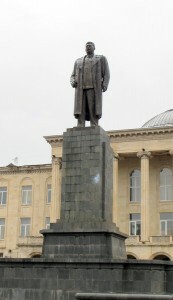 The tall statue of Stalin still dominates the town square. The Stalin Museum still provides a positive narrative of Stalin’s life with a focus on the great Soviet WWII victory, and no mention of any awkward topics. The only change I noticed was the addition of a small gift shop, where the faithful can buy commemorative tee-shirts and mugs. I know that Gori suffered some bomb damage in the 2008 war, as well as being briefly occupied by Russian troops. However there is no longer any visible damage in the central parts of town. In general, things actually seemed slightly more prosperous than I remembered from 2007.